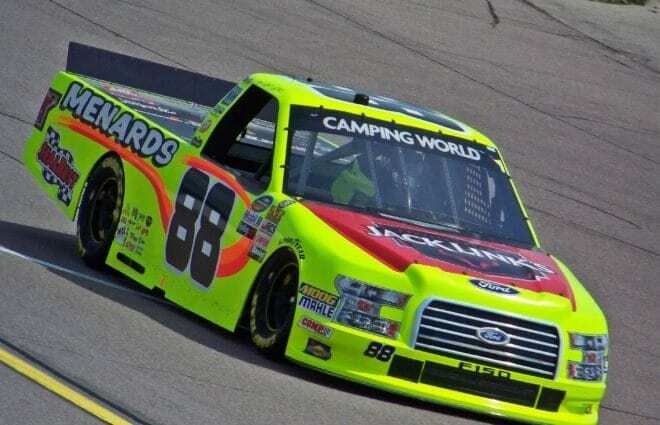 Matt Crafton is a two-time NASCAR Camping World Truck Series champion (2013 & 2014) and has 14 victories to his name in the series since his debut at California in 2000. The 18-year veteran has seen his fair share of comers and goers, witnessing the ups and downs of the sport firsthand. So far this season, it’s been more downs than ups with a continuous string of bad luck for his No. 88 Menards Ford. The slump continued in Saturday’s M&M’s 200 presented by Casey’s General Store, a mid-race wreck dealing a huge blow to the good run his Thorsport team was having. What’s gone wrong? Crafton isn’t blaming the transition the organization is going through currently from Toyota to Ford. Instead, he feels it’s just the type of rough patch that mostly all drivers face at some point in their career. Frontstretch caught up with Crafton on Saturday afternoon in Iowa to discuss some things about the NASCAR Camping World Truck Series and its place within the NASCAR landscape. 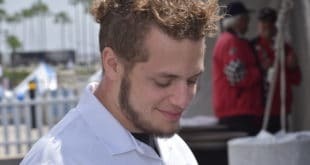 Christian Koelle, Frontstretch: Can you talk about the transition to Ford and what has set you back so far this season? Matt Crafton: I know the transition has gotten us a little bit behind but it’s just been sheer bad luck. Some of it has had nothing to do with switching over to Ford. I mean, you break a brake caliper bolt off like at Las Vegas on a pit stop when we had decent speed but we weren’t great. We were going to run somewhere from fifth to 10th, not where the (No.) 88 normally runs, but we knew we weren’t going to have too much speed right off the bat until we got the right balance. We came down pit road and the left rear brake caliber studs shear off … that’s just a s—– day. It’s been more bad luck than anything that has gotten us behind, where we are now. I think some of it is that we have gotten new tires this year. Goodyear switched to probably about 80 percent of the racetracks run with a different tire, different compounds. Some of the old setups that we have been very successful with haven’t been working out that well now. RACE RECAP: @Matt_Crafton starts a track-best second and leads laps, but a late-race incident relegates the @Menards driver to 26th at @iowaspeedway. 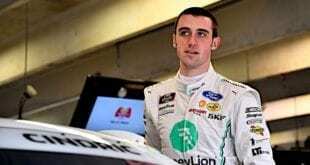 Koelle: As a veteran of the sport, what is it like to see these young kids run through the Truck Series and into the XFINITY Series. Is it cool to watch the younger generation and help the next generation by racing against them and giving them tips? Crafton: Norm (Benning) is older than me. It’s cool, the ones who will come and talk to you. Most of them, though they know everything. It’s just this day and age where some of these kids, they know all and they’ve never done wrong. A lot of them move up not because of what they’ve won but what they bring to the table. Koelle: We have two straight standalone races (Iowa and Gateway). Do you like this better than when we race with Cup? Crafton: I like it better. If you look back in the day when the Truck Series had more standalone events, the trucks had more people in the stands. If you have three of us (Cup, XFINITY and Trucks) people can’t get off on Friday nights and come to watch a race at 6 or 7 p.m. It’s hard for people to leave their jobs early. I truly believe that hurts the Truck Series, but whenever we race on a Saturday or a Sunday, we have a better turnout. I think we need to be separated more from XFINITY and Cup. Koelle: There are some old tracks that are starting to make their presence known again in the K&N Pro Series to test out the market. Memphis is one that comes to mind. What old tracks would you like to see return to the Truck Series? Crafton: Memphis is definitely one of those at the top of the list. IRP is definitely one of my favorite tracks we used to go to and for whatever reason, they took the trucks away from there and took XFINITY cars away and put them over at Indy and you get to take naps. It’s not what the Truck Series was built on. The series was built on short tracks. I don’t want to do all short tracks but I think we need more short tracks. We have Milwaukee just sitting there rotting away as well; that’s another great racetrack we should be going back to. We should go to another road course. We were all under the assumption that after two to three years, we’d have another road course. I hate it for all the team owners who spend all the money building a truck for one race. We should go to Watkins Glen, Sonoma, Mid-Ohio, Road America. Just step back and look at the people at the racetrack. I think the only Cup race I remember hearing was a sellout was Watkins Glen. When we go to Canada, we have a ton of people there. At some point, we need to step back and go where are they getting the people and we need to do that some more. Koelle: Speaking of the one tire conversation with road courses, we only use one tire for Eldora once a year. Would you like to see more dirt races added to the schedule? Crafton: Eldora is a hard subject. I love to dirt race because it is so different and I did win it last year. It’s a lot of fun and it’s great for the fans but for the owners, it’s not so great. You tear up the body and the pay is horrendous. I think I finished fourth, third and fifth in a Truck Series race and won that much money. Goodyear gives you a break on tires because it’s a bias spot tire but it’s still outrageous what we pay for a tire to go to Eldora that should be $150 per tire, not $450 per tire. If they made the tire to where it should cost, you wouldn’t struggle so much to go there. Koelle: With NASCAR announcing the 2019 schedule for the Truck Series, there are minimal changes with the exception of one big change with Texas. What do you think about the fact that Trucks’ second date moves to April from November and then the organization heads right back to Texas in June? Crafton: I think it’s weird. I don’t know why they got rid of Texas in the fall with us but it is what it is and those are high-powered people who know more than me. At least we’re going there twice and we should have 25 races a year, not 23. They cut the schedule back to 22 from 25 a long time ago to save teams money but in a sense, it cost people money. Because all you did if it was 25 races and you do have a sponsor and you’re getting paid to go to the racetrack and you cut it back to 22 races so those other three weekends that you used to go to and get paid by a sponsor to go to the racetrack and be on TV, you lost that. I think that hurt the Truck Series. We need to go back to 25 races for sure. Koelle: What do you think about this whole condensed schedule that NASCAR has laid out in the past and has been laid out this weekend with just one day of on-track action, especially being as it has seemed like we’ve had a bunch of sit-around time? Crafton: If you are going to bring us here for two and a half hours for tech and you make us come in here at 1:30 the day of tech to do that and then leave at 4. That’s crazy. The guys are already here. Why don’t you do practice more around when you are going to race? These guys had to be here at 7 a.m., the race doesn’t start till 6 p.m., so by the time the race is over, they will have at least 14+ hours. Go ahead and get stuff done, we already spent the money. Koelle: Would you like to see the points system go back the way it was or would you rather it stay like it is now? Crafton: I like the points system the way it used to be. It was rewarded by putting a season together, not eight races together. Look at 2015, we won six races and didn’t win the championship. The other years, I didn’t win the championship but I went to Homestead and won. If that had been ’15, I’d have won the championship after not putting a full season together while Erik Jones put everything together as a whole season. Previous Did You Notice? : Does NASCAR Practice Make Perfect? Next NASCAR Mailbox: Will Iowa Ever Have a Cup Race? I no longer watch the trucks because they all run chevy engines. Arnold Decker nailed it. Who wants to watch an LS spec engine series?